Absolute Beachfront- Wake up every morning to sand and surf on your doorstep! 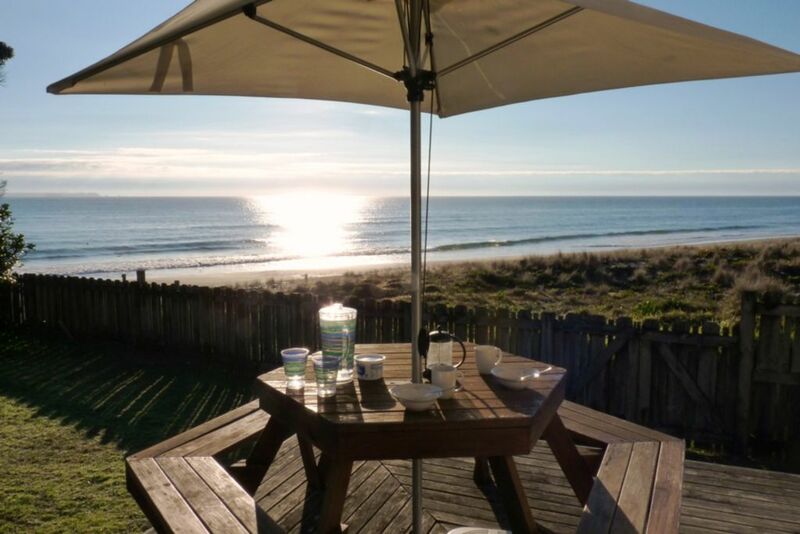 Ocean waves and sandunes with fabulous views to Mount Maunganui, Maketu peninsula and out to Motiti, Mayor and White Islands. We border undeveloped land as far as the eye can see. Our free-standing log fire makes this the perfect cosy, romantic winter retreat, bags of wood available at local garages and shops! Section fenced for added safety. The new cinema, shop, pub and eateries are only 1.3 kms away or a short 7-10 minute walk. A 5-minute drive takes you to Palm Beach shopping centre with it's very modern library and the shops at Fashion Island, with supermarkets, eateries and places for lazy coffees and chats. A 20 minute drive takes you to spectacular Mount Maunganui, which you can walk around and/or up and then relax in the hot pools at the base of the Mount. Treat yourself to a massage while you're there! A short drive will also take you to Tauranga or Te Puke! Fun filled Rotorua is only 50 minutes away, another hour will take you to scenic Taupo! . 1. Quiet bach, no parties please. Sleeps 7 adults/children. Price is for up to 4, extra guests $25 a night per person. 2. Duvets/blankets/pillows supplied. Please bring your own linen for the beds you are using and put your sheets and pillowcases on top of ours. Bring your own bath/beach towels. 5. Cleaning option $65 or leave bach as found. 6. Shorter stays may be available in high season. Enjoy! Take a step back in time in our older style bach and chill out amongst the waves and sandy shores. On one side of our property, undeveloped land as far as the eye can see, right down to the Kaituna estuary. Straight out the door! Just a hop, skip and jump to the sand! Look out the window to watch those waves roll in! All the fun of a waterfront property. Carport that can take 2 cars, end to end. What an amazing stay, breathtaking views and such friendly people!! We will definitely be back soon. Perfect quiet spot at the end of the papamoa . An incredible location . My 5yr old loved it here, a fantastic bach with everything you need. We had a wonderful time. The property was clean , we were provided great directions by the owner. Great value for money. We loved staying at this beach house. Had all we needed and right on the beach. The location is excellent, right on the beach. The house, although a little tired was brilliant for young children. The backyard had a shade cloth so you can enjoy the view of the sea and landscape without being exposed to the sun. Beautiful home. Clean and tidy when we arrived. Everything you need is there. Close to the Papamoa Plaza and a 4 Square 5mins away. We plan on returning and stay a bit longer.